In 2005 I bought a plant of Roscoea cautleyoides from Aberconwy Nurseries. I grow it in a raised bed and it is now a well-established clump with twenty-eight flower stems this year. In its first year it had just one flower stem so it is obviously very happy in its present position, but I am sure it would do just as well in the open garden. I have become very fond of this plant and it is much admired by visitors to the garden. 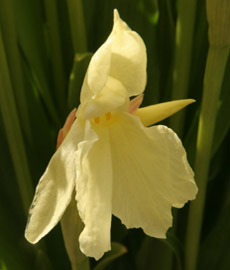 It comes into flower around the second week in May and the flowers remain in good condition for up to four weeks. 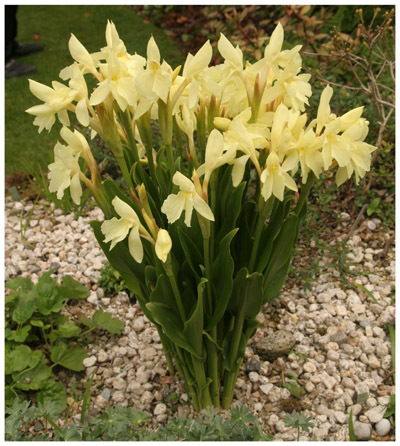 With its pale primrose-yellow flowers it is like a beacon in the garden especially in the late evening. After the flowers fade the 50 cm green stems persist for the rest of the summer. I also grow a form of this species which I got as ‘Kew Beauty’. This comes into flower about three weeks later than the aforementioned plant. I think ‘Kew Beauty’ is the more widely grown form of the species and this explains why so many people are surprised to see the other plant in flower so early. ’Kew Beauty’ has slightly larger flowers and is shorter, up to about 40 cm, but I prefer the plant I grow in the raised bed which I think is just the basic species. R. cautleyoides is a very variable species. It is easy to please and, for me at least, is one of the most attractive members of the genus. There are some fourteen different forms in cultivation and colour varies from the pale lemon of both my plants to a deeper yellow and onto various shades of purple and even red. The purple form is known as R. cautleyoides forma sinopurpurea. All the forms are I think worth growing but from photographs I have seen I would seek out ’Dark Beauty’, ‘Purple Giant’, ’Wine Red’, ‘Reinier’, and ‘Vien Beauty’.